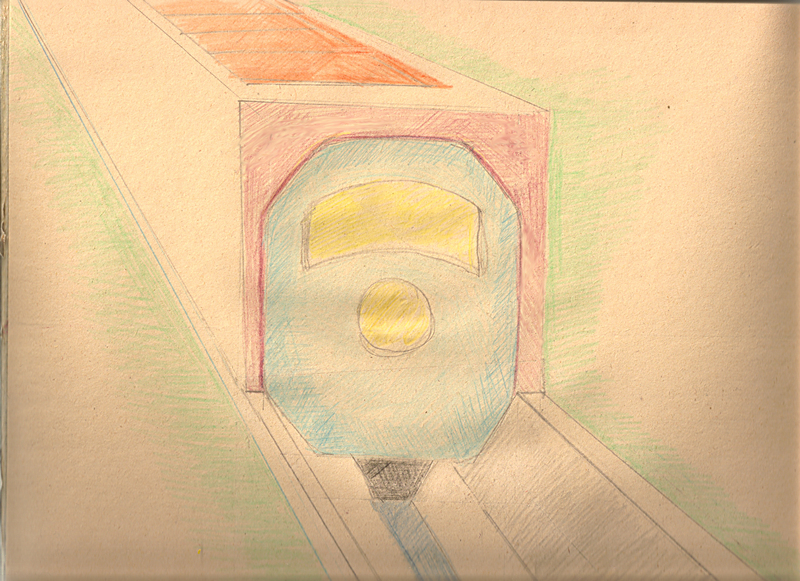 Simple pencil drawing of a cross-section of the train. I totally admit that it sounds absolutely vain to have a title of this nature, but many good solutions can come from common folk who think deeply about a problem. I encourage you, dear reader, to make suggestions on how to make this idea work better. My intention is to put America to work and end dependence on fossil fuel and thereby clean up the environment and make the air cleaner to breathe. America needs better mass transportation. we lag behind much of Europe, Japan and China (and probably other places too) with our train system. Those places have high-speed bullet trains. I think we should go them one better. If America had better and more attractively priced public transportation we would drive less and create less pollution and use less fossil fuel. My idea is for the government, in conjunction with the train companies, to build a high-speed train to connect America’s hub cities. This would be no ordinary train. It would be solar-powered by panels set on top of the tube through which it would move. This could be a similar application to solar roadways that I cited in an earlier blog post.The train would be set about one-third into the ground with the tube built around it and it would have a modified octagonal shape with rounded corners. It would have only one track and might work by the maglev system. The most famous maglev train is in Shanghai, China. Sitting the train in a ditch and surrounding it with a tube would make it safer and faster as inertia could be modified within the tube through a suction like effect. There would be no collisions possible due to the train being inside the tube. No animals would be killed on the track because the train would be totally enclosed. Because it is only in a ditch and not in a subway tunnel the cost would be lower to build. Thousands of American workers would be employed improving the grassroots economy of the country. Building the train system would provide construction jobs. There would also be maintenance jobs and service jobs running the complex rail system. There would be hundreds of engineering jobs in creating the plans and execution of this idea as well as thousands of peripheral jobs in train station services. Using the solar-powered train would lower the dependence on fossil fuels. It is a win-win situation for the country. No longer would we lag behind China, Japan and Europe. This rough idea that has excited my imagination came to me all in one piece in an open meditation. The first photo in this article bears a resemblance to my drawing especially in the area of the furrow in which the train runs. In answering the comments on the previous post, I was reminded of an amazing cat story in which I participated briefly. This happened in New York City’s East Village circa 1990. A woman, an artist, who is now deceased lived across the hall from me with her husband and a cat named Bass. It was a sixth floor walk-up with an elevator that sometimes worked. I did occasional readings for the woman in exchange for a glass of wine. We were sort of friends. I had a special relationship with the cat and would read him from time to time by petting him and mentally asking him questions, to which he would answer directly to my mind very clearly. I would convey this information to the woman, who would then generally do what the cat required. One evening the woman told me how the cat had come to live with her. It was a cold winter night as she made her way home. When she got a few steps from the doorway of the tenement, she became aware of the cat meowing pitifully behind her. She bent down and petted his shivering body, promising to bring him a can of cat food when she got up to her apartment to fetch it. I think the woman had once had another cat that had passed on some years previously and she remembered the lingering can in her cupboard. She unlocked the two bullet-proof glass doors that separated the January chill from the steam heat. The elevator worked that evening and sped her to the sixth floor. After unlocking the door to her tiny home, she put down her handbag on the kitchen table and fetched the promised can from the cupboard and headed back to the door of her apartment two steps away with the intention of bringing down the cat a nice supper. Imagine her surprise when upon opening the door who ran into her apartment but the very cat! She hadn’t let him in and he wasn’t in the elevator with her, so it was rather mysterious how he had gotten in and found her door on the sixth floor so quickly. But it was clear that the cat was at home so she allowed him to stay, especially since her husband, a musician, was out of town on a gig. Several nights later when her husband was still away, the woman had a startling dream, almost a nightmare, that filled her with awe. The cat came to her in a realistic dream as a giant cat-headed figure larger than a human, and in a deep and resonant voice that shook her body, proclaimed, “I am Bass!” or at least that is what she heard. So naturally she called the cat Bass. And Bass became an accepted member of the household. Now the woman, an artist, as I had mentioned previously, was an intelligent college educated person, but apparently never studied any ancient Egyptian mythology, because when I asked her if she was certain that the cat in her dream said Bass and not BAST she looked at me blankly and said something like, “I think so, what difference does it make?” I found it remarkable that she had never heard of BAST. 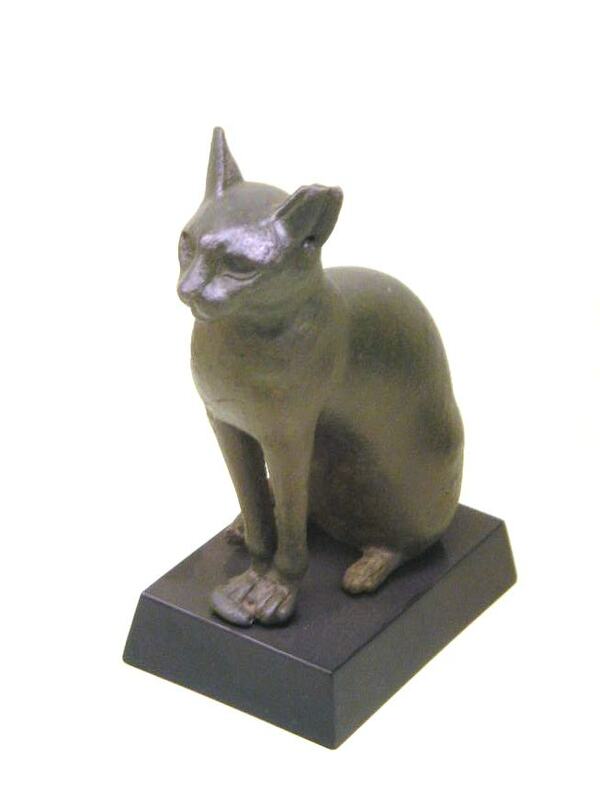 BAST is/was the protector Goddess of lower Egypt, where cats were worshipped and none so much as BAST. She is a glorious cat-headed woman in some renderings while in others a proud lioness or an elegant cat. The town of Boubastis in the Nile Delta was her sacred place. Now the problem with this whole story is that BAST is a Goddess and Bass was a male cat, yet I feel sure that the woman had a visitation from the Goddess BAST. I told her so and though she mulled it over in her mind, I remain unconvinced that she was duly impressed with the divine encounter she had been privileged to receive. Several months later, it came out in a reading that the woman and her husband would be moving to California. She requested I ask Bass if he would be pleased with the move. I held the cat on my lap and questioned him. He was alarmed. He did not want to go under any circumstances. A couple of months later they moved to LA taking Bass with them, in my opinion, against his will. About two weeks after the move, I found out later, the cat got out of the house and was promptly run over.